The What-Cha-Ma-Bucket pattern is the perfect fabric container to use as a notions caddy or to carry a hand works project or your knitting! There are 2 design options for the handle - a loop style handle that can be opened to attach to your belt or a bucket style and this pattern comes with instructions for 2 interior pockets. 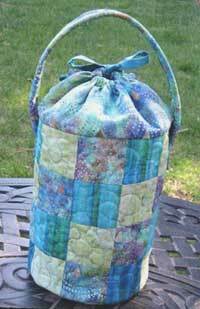 Finished size is 10" H (not including handles) x 5 1/2" W x 5 1/2" D. Pattern pieces included for top and bottom of bag.